Bathtime should make any Bernese mountain dog grin. 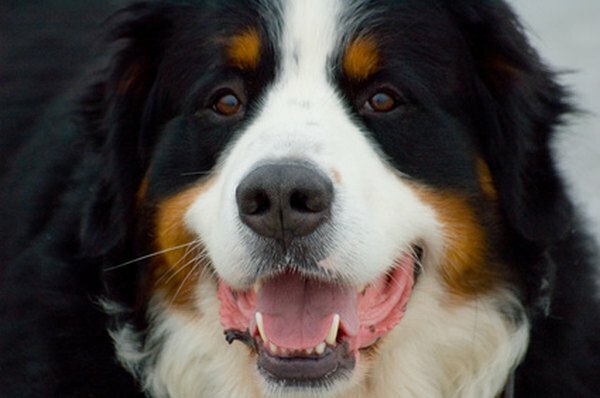 The Bernese mountain dog is a large, friendly breed with a fluffy coat. Routine grooming is a necessary part of owning a Berner, and bathing is essential to keep the dog’s coat clean and full. Bathing a big dog is a challenge, but it doesn’t have to be a struggle. Pour one part coat conditioner into a spray bottle, and add two parts warm water. Mist the dog with the conditioner mixture before brushing. Bernese mountain dogs have long, plush coats, and brushing a dry coat will break the soft hairs. Comb the dog with an undercoat rake. Bernese mountain dogs shed throughout the year, with the heaviest shedding occurring in spring and fall. Pull the hair apart with your hands, brushing from the skin out to the end of the coat. Rake the dog from the base of his ears, down his front legs and back to his hindquarters to prevent mats from forming along his body. Brush the freshly raked coat with a pin brush. The pin brush removes dead hair near the surface and gives your Berner his trademark fluffy appearance. Hold the dog’s tail even with his topline and brush the hair straight down to the floor to remove tangles and produce a full, bushy plume. Clean the brush frequently, using a small comb to remove hair stuck between the pins. Clean the dog’s ears with ear cleaner and a cotton ball. Hold the ear leather upright and wipe the entire inner surface of the ear. Wipe the area near the ear canal gently, and hold the ear up until the cleaner evaporates. Place your Berner in the bathtub and soak her coat with clean water. Add a couple handfuls of dog shampoo to the wet coat and massage it throughout her fur. Select a moisturizing shampoo to impart moisture without weighing the hair down. Rinse the dog thoroughly, pouring water over the coat until the water runs clean. Drain the bathtub and dry the dog as much as possible with clean towels. The heavy coat of the Bernese mountain dog soaks up a ton of water, so swap to dry towels when the old ones are saturated. Dry the dog’s legs and feet to prevent her from slipping if she tracks water on the floor. Dry the dog with a low-heat hair dryer. Turn the dryer to low, and brush the dog as you dry to restore body and volume to the coat. If the dog is afraid of the dryer, give her a few treats to turn bathing into a positive experience. Bernese mountain dogs are fairly clean and should only be bathed when their “doggy odor” becomes too powerful. Don’t leave the dog’s coat wet. Some Berners are prone to hot spots if the coat stays damp for extended periods of time.